Trackting is a completely automatic smart system. It is situation sensitive and reacts accordingly. Find out how Trackting works to make the most of it! Let’s start with what you find in the kit: 1 Tracker (the black box) and 1 Tag (the red keychain). The entire system is coordinated by the Tracker which encloses an advanced motion sensor, a GPS satellite receiver and a SIM that connects to the Internet. 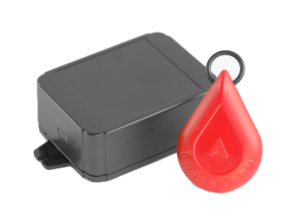 The Tag enables Tracker to recognize you automatically if you drive your vehicle or are within a range of approximately 15 meters. It does this automatically, by transmitting its unique identification code. To maximize battery life, the Tracker stays in Standby mode. This means that Tracker will not track your position continuously, but will always be ready to react to a possible theft attempt in your absence. For this reason, unlike other devices that work with SMS, it is not possible to query the Tracker, since the Tracker itself will send its latest status to your App. When your vehicle is moving, the Tracker exits the Standby mode to see if the Tag is nearby and verify that you are the one moving it and not a thief. If the Tracker finds the Tag nearby, it returns to Standby mode. It will not track your position while driving. This will protect the battery life and your privacy. NOTE: as you drive, your App shows that your vehicle is still in the last parking position. This is not a problem, but correct functioning! 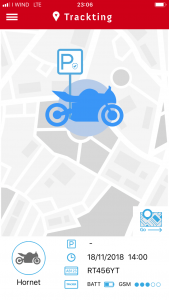 Once your vehicle is parked, the Tracker does not sense any motion and self-activates automatically after a few seconds to protect your bike. After about 8 minutes, you will receive notification of the parking position. From the moment you parked your vehicle, the Tracker becomes sensitive to motion that could be caused by a potential thief. – Why does it take 8 minutes to receive the parking position? To preserve the battery life and avoid unnecessary notifications when you drive around town and make several short stops. – Should you not receive the Parking notification due to a lack of coverage or cellular network failures, do not worry your vehicle is still protected. – Even if you receive notifications without a Parking position (see the image below) your bike is still protected. It only means that Tracker was unable to receive satellite signals from that particular location but when the vehicle starts moving, the position would be sent as soon as Tracker could see the sky. Trackting switches from Parking to Alarm mode if someone is tinkering with your bike or worse, is trying to move it. If the Tracker motion sensor perceives movement and does not detect your Tag in the vicinity, it immediately activates the Alarm mode. 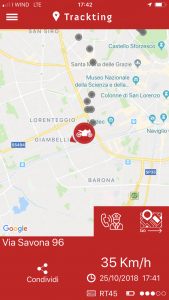 Within one minute you receive an Alarm notification and your App starts tracking the vehicle, allowing you to locate the thief. The App will show you its position, direction and speed in real time. The position is sent dynamically depending on the speed of the vehicle and not at predefined intervals: even in Alarm mode, Tracking optimizes the life of its battery. The system will exit the alarm mode when the Tag stays near the Tracker for at least 1 minute while the Tracker is in motion. So to turn off the alarm, simply get on your vehicle with the Tag and drive for 1 minute. The Tracker encloses a rechargeable battery via USB. To charge it, use a mobile power supply or a Power bank with a capacity > 2.500mAH. After charging is complete you will be notified on your App. The Tag contains a non-rechargeable button cell battery (model CR2032) that lasts for over 1 year. The status of the batteries is displayed in the “My Trackting” menu and you will be notified as soon as the charge of one of the two batteries is low. When charging, the Tracker turns off automatically, so if you leave it permanently connected to a power source it will not work. But no worries, should you inadvertently stay connected to a charger for a long time, an internal protection system will keep you out of trouble!